The term 'The Good Dog Guide' or 'us' or 'we' refers to the owner of the website. The term 'you' refers to the user or viewer of our website. Neither we nor any third parties provide any warranty or guarantee as to the accuracy, timeliness, performance, completeness or suitability of the information and materials found or offered on this website for any particular purpose, including competition prizes that may be offered. You acknowledge that such information and materials may contain inaccuracies or errors and we expressly exclude liability for any such inaccuracies or errors to the fullest extent permitted by law. Your use of any of the listed businesses' services, information or material on this website is entirely at your own risk, for which we shall not be liable. It shall be your own responsibility to ensure that any, services, products or information available through this website meet your specific requirements. Local councils may require dog related businesses, like walkers, boarding hosts and kennels, to obtain a licence to allow them to look after animals in their care, it is the listed business's responsibility to adhere to these laws and regulations and not the responsibly of The Good Dog Guide Ltd, for which we shall not be liable. This website contains material which is owned by or licensed to us. This material includes, but is not limited to, all listing information, text, design, layout, look, appearance and graphics. Reproduction is prohibited other than in accordance with the copyright notice, which forms part of these terms and conditions. All businesses, companies and persons who submit content to be included on this website agree all details they are adding are correct and up to date. It is the responsibly of the listed business, company or persons to make sure all required insurances and licences for their business are in place, current and up to date. By requesting us to design your listing or banner advert for you, you are agreeing that you have full copyright of all the information you supply to us and your own website, where we will use information from to design your advertising, including all text, images and videos. Information we use about your business, that has been taken from your website, email or social media, including your images, logo and business information will be placed on The Good Dog Guide website and shared across our social media including Facebook, Twitter, Google+ and Instagram. 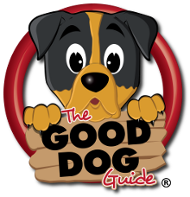 The Good Dog Guide allows reviews to be posted by our users to all listing pages, including their comments and paw rating on the businesses that we list. All services that require payment must be paid for upfront by Credit/Debit card, Pay Pal account or cheque/postal order. Your listing will only be available once we have received cleared funds (unless agreed otherwise). All paid for premium listings are non-transferable. We offer a 14 day cooling off period with full refund.